VOCIONE is an atypical duo. Two instruments and the many struggles in dealing with such an ensemble, voice and trombone, and by performing with precision and discipline, should transcend the obstacles in order to overcome barriers that arise and to avoid any pitfalls. In this adventure, the protagonists, however, have developed a taste for all that is unpredictable and risky, for everything that leads to the unknown. 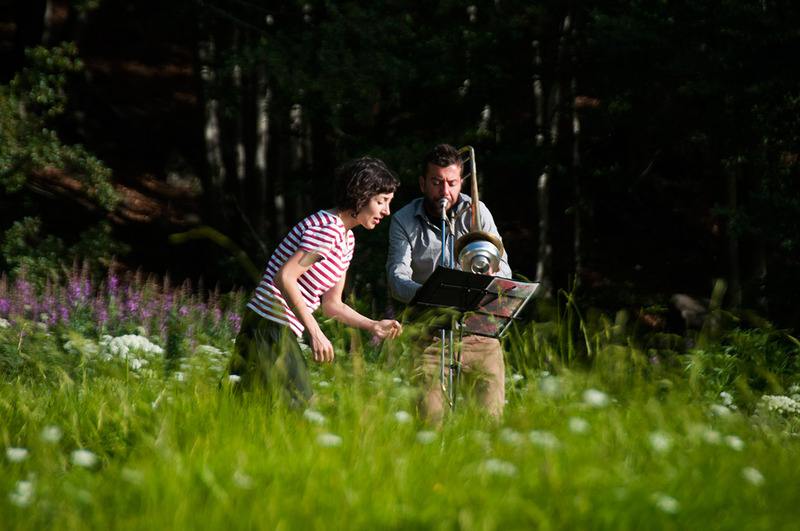 And, therefore, VOCIONE is a daring duo in which the voice of Marta Raviglia and the trombone of Tony Cattano confront each other on an unpredictable playing field. It is the music, from time to time, that suggests strategies. The repertoire of the duo includes, in addition to the songs of Tony and Marta, other songs taken from jazz and Brazilian tradition, spirituals, Renaissance ballads, baroque arias, and much more; everything is seasoned with irony and disenchantment. You are heard, VOCIONE, without fear of complaints from the neighbours. VOCIONE è un duo atipico. Due sono gli strumenti e molte le difficoltà nel confrontarsi con una formazione, quella voce e trombone, in cui il rigore esecutivo e la disciplina dovrebbero prendere il sopravvento in modo da sormontare gli ostacoli che si presentano e aggirare il pericolo.